All praise is due to Allāh who guided us to Islām, and He favoured us with it, and He placed us in the best nation – so we ask Him to grant us success to adhere to that which He loves and is pleased with, and to protect us from that which He hates and that which angers Him. This is the opening address of the book, so he began with “All praise is due to Allaah (al-hamdulillaah)” thereby acting upon the Sunnah. The Prophet (salallaahu ‘alaihi wassallam) himself used to praise and extol Allāh in his writings and sermons – and this was the way of the Pious Salaf and the people of knowledge. They would begin their books with the words “In the name of Allāh, the Merciful, the Bestower of Mercy” following in that the Book of the Almighty; and they would begin also with “All praise is due to Allāh, the Lord of the worlds” following the example of the Prophet (salallaahu ‘alaihi wassallam). So when he (salallaahu ‘alaihi wassallam) would wished to deliver a sermon or to speak to clarify a matter, he would praise Allāh and extol Him, he would then explain and clarify whatever he wished (salallaahu ‘alaihi wassallam). So the author, al-Barbahāree, has taken this same methodology following the Salaf and beginning with “al-hamdulillāhi” i.e. all praise is due to Allāh. If you were say, “I am grateful to so-and-so” or, “I praise so-and-so due to what he has done” with the meaning of specifying something for which you have praised him or thanked him, then in that there is no harm. As for you saying, “Al-hamd (i.e. all praise) is due to so-and-so” then this is not permitted except for Allāh (the Most High). As for “Allāh“, then it is a name from His names, the Most High. It’s meaning is “The One Diety (al-Ma’looh), The One Worshipped (al-Ma‛bood)”. This is because the meaning of al-Uloohiyyah (i.e. to single out Allāh as the Diety) is al-‛Uboodiyyah (i.e. to single Allāh alone with all worship). This is name that is not used except for Allāh – no one is to be ever named with this name other than Allāh Himself. Even the tyrants, the obstinate disbelievers and the godless athiests never named themselves “Allāh”. The Pharoah never said, “I am Allāh”, rather he would say, “I am your Lord the Most High.” So this name is specific and only for Allāh (the Most High). The bounty of Allāh mentioned here is Islām, and the mercy is the Qur’ān. So let them rejoice with Islām and the Qur’ān. The saying of Allāh, “You are..” is addressed to the Muslims. His saying, “..best nation..” meaning the best of all nations. And the intent of the term, Nation (Ummah) is al-Jamā‛ah. In the statement of Allāh (the Most High), “..best nation raised for mankind”, scrutinise the words, “..for mankind.” So the goodness of this Ummah is not limited to only upon their own individual selves – it does not suffice that a person learns and acts whilst he abandons others, rather he must spread the message, and spread knowledge, and spread the goodness, and call to Allāh, enjoin what is good, forbid what is evil and he becomes an active member of the Muslim Society. So the meaning of His (the Most High) saying,“..raised for mankind” is that they were not merely raised for their own benefit, but raised for mankind in general. Allāh’s Messenger Ibrāhīm (salallaahu ‘alaihi wassallam) feared for himself – and it is true that for every strengthening of Īmān in Allāh, a person fears and does not feel secure from being put to trial, and he does not praise himself, or sanctify himself. Rather he asks Allāh for steadfastness, asks Him for a good end to his life, fears a wicked ending. He fears falling into trials and tribulations – he fears deviation, misguidance and the callers to evil. The saying of the Imām al-Barbahāree (may Allāh’s Mercy be upon him): “And to protect us from that which He hates and that which angers Him.” So He (the Most High) may grant us success in that which He loves and is pleased with of actions, sayings and beliefs – and that He (the Most High) protects us and keeps us away from that which angers Him from sayings, actions and beliefs. So He (the Most High) is The Guide (al-Hādee), The One who grants success (al-Muwaffiq) – He is the One who shows the way and gives direction. 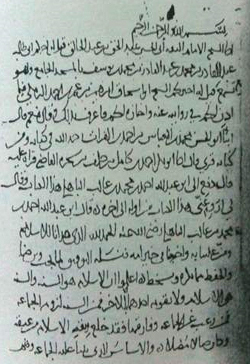 Reported by Muslim in his Sahīh (2/593 no.868) from ‛Abdullāh bin ‛Abbās (radhiyallaahu ‘anhumaa).